Notes: Reef-type dive. An intentionally sunk plane with a fake skeleton in it. Notes: Amazing visibility. Wreck is another island trader (see #68), scuttled in 1989. Stern is at 30 m. Bow is at 70 m.
Notes: Towards the end of some reasonably nice reef-type action, I was happily making a Damsel fish movie when Eithne got my attention. 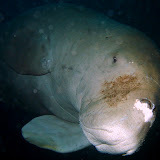 I turned around to face a Dugong! Crazy friendly creature, radiating contentment. Swam around us for ten or fifteen minutes. Some nice photos and a video or two. 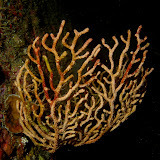 Notes: First dive in Vanuatu! Before taking on the Coolidge Gary and James wanted to get their AOW out of the way. Did it with Nautilus in Port Villa. We tagged along for some diving. 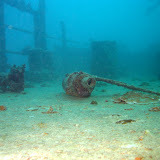 The Konanda wreck was an island trade boat damaged in a cyclone and scuttled in 1987. Nice easy dive. Warm water. No penetration but for a small swim through the bridge. The sea was dead calm on the journey from Villa, which took maybe 30 minutes. Nice crew on the boat. A few photos. This was the first of four dives with Nautilus. Since myself and Eithne were diving together, they charged us the same price per dive as one person would pay if they bought a six-pack. 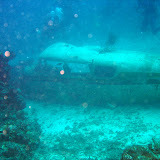 It worked out at 52800 Vatu in total, or almost AUD $80 per dive including gear hire. Not particularly cheap but then Vanuatu isn’t in general. Equipment: We only brought a snorkelling kit to Vanuatu, plus dive computer, camera, torch and compass. The rented gear here was pretty well worn. Didn’t record the makes/models. Many small air leaks.